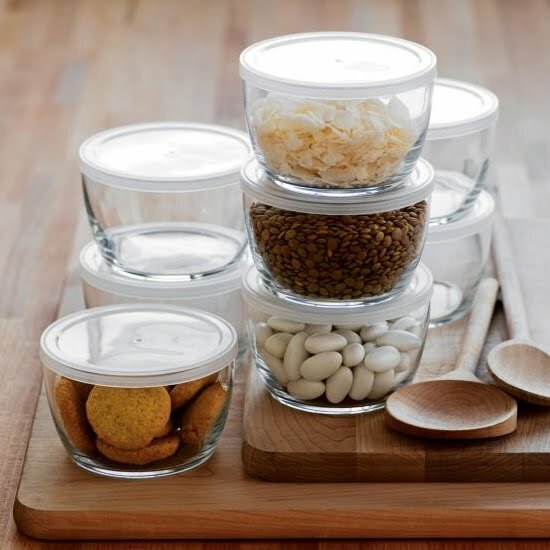 With fall approaching I've been on an organizing mission, and have been thinking about getting glass containers (for leftovers) to replace all of the plastic ones in our kitchen (for several reasons). So far the best option I've found is from Crate & Barrel. Below are the smallest size, and we'd get the larger ones, too. Does anyone own these or have other recommendations? probably not as pretty as the crate & barrel ones, but we really like our glass pyrex bowls from amazon. We have these for over a year and we LOVE them. They've held up to very heavy use and they go from the fridge to the microwave to the dishwasher without any problems. I store lots of things like cous cous, rice, sugar, coffee etc in different kilner jars. They are really pretty and stack well. They don't go in the microwave though, so purely for storing dried goods. I have had the larger 4-piece round set for 3 years and they are just starting to show signs of wear. The plastic lids are beginning to crack. Looks like the smaller size would be perfect for leftovers and carting to/from work......may have to order these! I am not so sure how the lids will hold up over time as pantry storage. Anchor Hocking has some options as well, but they aren't that great. http://www.anchorhocking.com/cat_25_pantrystorage.html And of course there is Pyrex. I am still on the lookout for the "perfect" pantry glass storage. I have a set of small ones by Libbey as well. They work very nicely, I've had them for about one year. We mostly need them for leftovers + lunches at work. I already have glass jars for all my pantry/dry goods and LOVE it. we love our glass pyrex from target. but i like the smaller sizes you show above. I really like Snapware. I feel like the lids on other glass containers sometimes stop fitting well, but the ones from snapware stay in shape! I bought mine at CostCo. angie likes glass pyrex for fridge leftovers. she just got some nice plastic ones for the pantry, though - they are OXO brand - very nice lids. I love the Martha Stewart glass containers at Macys. I have some of the larger ones from Crate and Barrel and use them all the time. I would like some of these small ones too. I might just have to order some. We use old school Mason jars (canning jars). You can find them anywhere, they have a vintage feel, and in expensive. I actually just wrote a post about it because we moved all of our dry goods into these jars. I love how I can see everything so easily. i really like those, they make the food being stored look good to eat. I always feel that plastic storage containers make your left overs just seem so un-appetizing.